We learned about SteadyCapitals through a webpage that is promising a lot of automated profits. The video on that page describes a miraculous trading robot that is free. What is the truth about Steady Capitals? 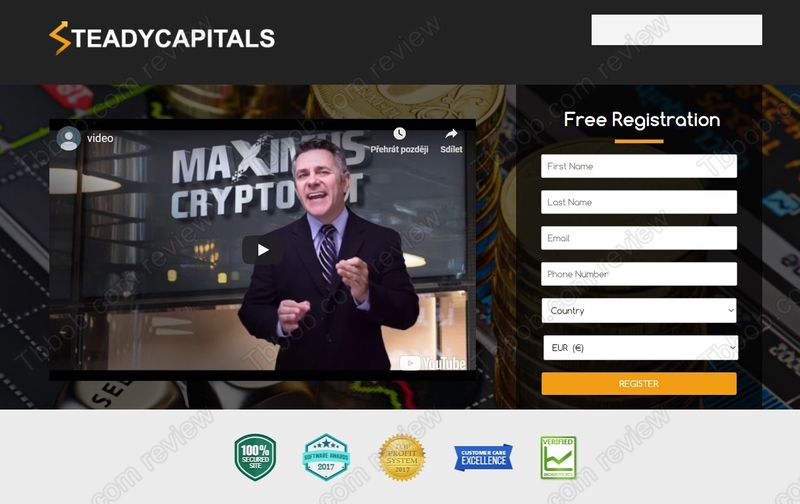 First of all, the video used on the Steady Capitals website is from the Maximus Cryptobot scam. This proves that Steady Capitals is a scam. Maximus Crypto bot is a very dirty scam. It pretends to be a profitable trading system for cryptocurrencies, but it is not. In reality it is losing money. Another proof that SteadyCapitals is a scam. Look at the testimonials, happy people are endorsing it. But pictures of the alleged satisfied clients are stock photos, so these reviews are fake! Scammers fabricated them to support their scam. SteadyCapitals is a binary options brokers that is allegedly based in the United Kingdom. Since binary options are regulated in the UK, every broker needs a licence from the Financial Conduct Authority. But Steady Capitals has no licence whatsoever, it is not regulated, therefore it is an illegal binary options broker. SteadyCapitals is a scam and an illegal broker, because it is not regulated, stay away from it! If you want to trade financial markets, try a free demo with a regulated broker to understand how things work. Should you decide to trade with real money, be careful and understand the risks associated with financial trading. Yo fui tambien estafado. He puesto denuncia en policia pero no se si habrá resultado. Necesito ayuda. ¿Me podrian dar algun consejo sobre lo que debería hacer, especialmente para localizar a estos delincuentes? I was also scammed. I have filed a complaint with the police but I do not know if it will have happened. I need help. Could you give me some advice about what I should do, especially to locate these criminals?